England is the number '1' travel destination in 2012 due to the following facts, the Royal Wedding of Prince William & Catherine Middleton last April 2011, and this young popular and charming couple set events into place to make this a must visit destination. With all the event happenings in 2012 it's quite awesome, much to do and see, and the UK will celebrate Queen Elizabeth's Diamond Jubilee on June 2 - 5, 2012, celebrates her 60 years on the throne on June 2nd, along with these local events, the Thames Diamond Jubilee Pageant a river pageant on the Thames, and then a concert at Buckingham Palace in June, and the Lighting of 2012 Beacons throughout the UK and Commonwealth. That's a very busy few days! Then London is still the focus further, as it hosts not one but two Olympic Games, the Summer Olympic Games 2012 in July and August, and also the Paralympic Games in August and September. 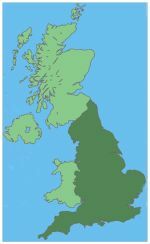 The map of the United Kingdom at the right shows England in the lower right darker green, and Scotland in the North in the lighter green, and Northern Ireland area to the left, and Wales in lighter green in the southwest [left of England]England's Capital is London. Northern Ireland is in the lighter green, is one of four countries of the United Kingdom. Northern Ireland's Capital is Belfast, Scotland's Capital is Edinburgh, and Wales Capital is Cardiff. England is a Non-Devolved State within the UK, Official UK Government website, and then there are the three Devolved States of Scotland, Wales and Northern Ireland. Each country has it's own government. The monarchy of the United Kingdom is the constitutional monarchy of the United Kingdom and its overseas territories. Queen Elizabeth II, is the present monarch, and has reigned since February 1952. The royal family take on various official, ceremonial and representational duties. Since the Queen is a constitutional monarch, she is limited to non-partisan functions and appointing of the Prime Minister. Ultimate executive authority over the government of the United Kingdom is still by, and through the monarch's royal privilege, these powers are constricted and can only be used according to laws enacted by Parliament, and, in practice, the constraints of convention and precedent set-forth by Parliament. Our England Tours offers a wonderful and diverse selection of escorted bus tours through and around England, Scotland, Wales and Ireland. With dozens of itineraries from 5 to 20 days. Value priced tours with three and/or four star hotels, and some tours include most meals, and can be 'All Inclusive' with air included! Call for details regarding inclusions, and a day-to-day itinerary will be sent to you. When it comes to escorted coach tours to England - we offer you the best tours by the best tour suppliers for England, Ireland, Scotland and Wales! On ultra-modern coaches with friendly, knowledgeable drivers and guides to ensure that your vacation to Britain will be one to remember for years to come! Our most popular Britain vacation offers you the best of this great land. Guided sightseeing shows you all the famous landmarks in London: Parliament, Big Ben, Westminster Abbey, Buckingham Palace, and visits to St. Paul’s Cathedral and the Changing of the Guard, if held. Head southwest to admire the breathtaking gardens at Henry VIII’s Hampton Court Palace, then venture on to prehistoric Stonehene and more . . . 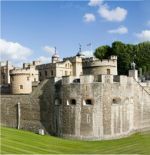 The Best of Southern England (GV) Starting at: $1,249 (not including airfare) - 7 days from London to London, or 8 days incl. travel. See the places you’ve always read about on this exciting journey through southern England. Begin in London with guided sightseeing that shows off the city’s most famous landmarks: Parliament, Big Ben, Westminster Abbey, Buckingham Palace, and visits to St. Paul’s Cathedral and the Changing of the Guard, if held. Stop to admire the breathtaking gardens at Henry VIII’s Hampton Court Palace and more . . . This vacation offers a panoramic exploration of England, Wales, and Scotland. Begin with an overnight and free time in London, then head west to prehistoric Stonehenge, picturesque Salisbury, and Widecombe-in-the-Moor in Dartmoor National Park. Spend two nights in Plymouth, with an excursion to Land’s End and the seaside resort of St. Ives. Travel north to Glastonbury of King Arthur fame and stop and more . . . Essential Britain & Ireland (GB) Starting at: $1,849 (not including airfare) - 10 days from London to London, or 11 days incl. travel. 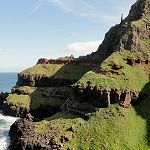 This comprehensive vacation introduces you to all five countries that make up the British Isles. Start with an overnight in London, then head west to prehistoric Stonehenge, picturesque Salisbury, and the extraordinary Roman excavations in Bath. Next, spend a night in Newport, Wales, and travel via Cardiff to Pembroke for a ferry crossing to Ireland. Enjoy a guided tour of the House of Waterford Crystal and more . . . Highlights of Britain & Ireland (GK) Starting at: $2,579 (not including airfare) - 15 days from London to London, or 16 days incl. travel. Journey through the lands of kings, queens, and leprechauns! Begin in London with two overnights and guided sightseeing that features Parliament, Big Ben, Westminster Abbey, Buckingham Palace, and visits to St. Paul’s Cathedral and the Changing of the Guard, if held. Depart the city to admire the breathtaking gardens at Henry VIII’s Hampton Court Palace, then venture on to prehistoric Stonehenge and more . . . The Best of the British Isles (GL) Starting at: $3,349 (not including airfare) - 20 days from London to London, or 21 days incl. travel. Discover the best of England, Scotland, Wales, and Ireland on this getaway that features five 2-night stays. Your journey begins in England with visits to London, Hampton Court gardens, Oxford, Shakespeare’s Stratford-upon-Avon, Warwick, and medieval York. Heading north, it’s on to the Scottish Lowlands and Highlands for visits to Edinburgh, St. Andrews, Braemar, Inverness, Glasgow, Gretna Green and more . . .
Britain & Ireland in Depth (GT) Starting at: $4,149 (not including airfare) - 25 days from London to London, or 26 days incl. travel. This vacation offers our most complete view of the British Isles. In England, enjoy visits to London, Canterbury, the seaside resort of Brighton, mysterious Stonehenge, Salisbury, historic Plymouth, Land’s End, St. Ives, and the Roman Baths. Stop in the Welsh capital of Cardiff and travel across South Wales, then take a ferry to the “Emerald Isle.” Visits include Waterford, Blarney, Killarney and more . . . There is no doubt today that tours to and within the UK are accommodating you -- to your choices and selections. These escorted tours are from 8 to 20 Days and the selections are yours to make! From a 3 to 5 star hotel and add-ons for your trip. All the basics are included and we've noted the most popular England tours with a * so that you can view those along with all the other tour options. View the PDF Itineraries of your choice then call for more details, flight costs and any additional add-ons. Tours operated by Trafalgar and offer several options to include PARIS and other countries. travel or a Self-driving tours, that is easily arranged as well and quite popular. Call us or email us for more information.